So, the boy has a balcony. He is still working, but I am taking a few days off, which means that when he invited me to come work with him on the balcony, I knew exactly what “work” I would bring. 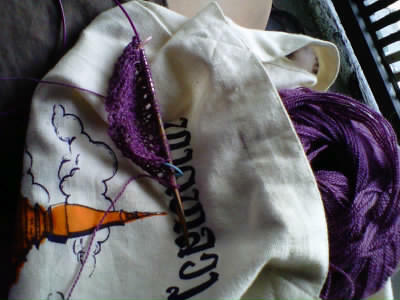 As you can see, I’ve cast on my citron in the Classic Elite Silky Alpaca Lace, and I’m already past the set-up section. I’m going to have fun with this – I can tell.